Still think war isn’t coming? Islam has planted so many Jihadists in France, they are now rallying by the thousands against… Europe. Remember Erdogan? Obama’s best friend? He led a rally of 12, 000 in Strasbourg, France, where the crowd shouted “Allahu Akbar!” during his speech. He railed against the Kurds and against Europe. And get this… Erdogan was to speak on counter-terrorism. That’s funny! What a joke. He is a supreme terrorist and a monster. He called for Muslims to basically unite against Europe the way the Ottoman Empire did. Because you see, he views Turkey as the resurrection of the Ottoman Empire and he has delusions of ruling the planet. It’s beginning to feel a lot like world war out there these days. 12,000 supporters came out to hear Turkish leader Recep Tayyip Erdogan speak in Strasbourg, France. The crowd chanted, “Allahu Akbar!” during his speech where he lashed out at the European Union. Erdogan also told the crowd the “hearts (of the Turkish people) are united in the same way” they were during the Ottoman Empire’s battles against Europe! Turkish leader Recep Tayyip Erdogan vowed to “crush” Kurdish “terrorists” and harangued the EU over its handling of the migrant crisis at two rallies on Sunday (4 October). 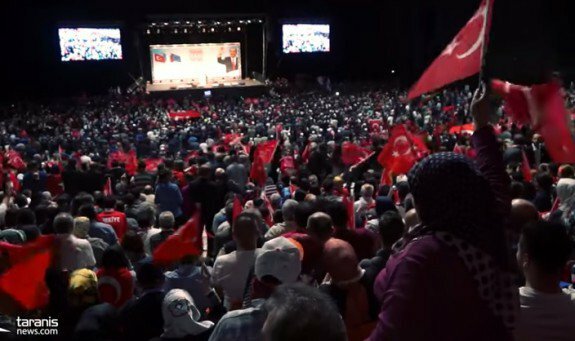 The first event, in Strasbourg, France, saw about 12,000 French, German, Belgian, and Swiss-origin Turkish supporters hear him speak on counter-terrorism, the AFP news agency reports. He didn’t mention Islamic State. But he vowed to “crush” the PKK, the Kurdish separatist movement. He also accused the EU of doing little to help Turkey share the “burden” of Syrian refugees. His speech had an Islamist and anti-European tone. It was preceded by a Muslim prayer. Erdogan described Turkish soldiers killed in recent PKK hostilities as “martyrs” and the crowd chanted “Allahu Akbar!” in return. He said the “hearts [of the Turkish people] are today united the same way they were” when the Ottoman Empire fought European powers in 1915 and when Turkish Sultan Mehmed II conquered Constantinople. This display should terrify Europe, but they act blissfully ignorant to what is going on right in their midst. Just stunning. Erdogan spoke of “martyrs” and the crowd went wild. He’s not going after ISIS, he’s going after the Kurds. You know, the good guys and he is being helped by Obama and the Russians. He is doing what Islamists always do… calling the good guys terrorists and claiming they are the ones wronged. Notice how he is using the Syrian refugee crisis as a rallying point against Europe. Most of those refugees don’t come from Syria and he damn well knows it. It is an Islamic invasion and Erdogan is cool with that. He is looking for rhetoric and propaganda to excuse getting his violence and war on. Those aren’t French flags flying at that event – they are the Islamic crescent of Turkey. They also signify the Caliphate. Europe is set to burn.